Yoga Beyond Belief will appeal to anyone practicing yoga today-from beginner to experienced student. It is a “cross-platform” manual, applicable to all yoga styles and a lifelong handbook and textbook for students of all levels as well as for teachers. It contains sophisticated tools and insights to create, hone and integrate daily living and personal yoga practice and contains a collection of valuable insights and anecdotes gleaned from a lifetime of exploration, practice, study and teaching. Complete and accessible for beginners, Total Yoga, created and taught by Tracey Rich and Ganga White, is the perfect introductory program to the simple techniques and profound benefits of yoga. Experienced students will find the unique design of this self-contained workout a valuable, effective addition to their daily routine. Total Yoga is Hatha-Vinyasa Flow yoga, and the gentle moves will tone and shape muscles, improve flexibility, enhance circulation, build strength and increase stamina. Yoga can also provide additional benefits not usually associated with working out: a dramatic reduction in stress and an increased feeling of calm and inner peace. Approximate practice time: 60 minutes. TOTAL YOGA: The Original - ONLINE! View high definition versions of these high quality videos on your computer or device, with full screen option. Stream the videos to your internet connected device. Three unique and distinct yoga sessions created and taught by Tracey Rich and Ganga White bring the benefits of a balanced daily home practice to all levels of students. The first in this series, Earth, builds foundations by introducing sun salutations, standing and other classical postures that emphasize flexibility, attention, flow and breath in a comprehensive, restorative manner. Water, advances the postures for continuing students by incorporating the fluidity and grace of Hatha Vinyasa, or flowing transitions, and integrating a broader complement of standing, seated and inverted yoga postures. Finally, Fire forges elements from the first two videos into a higher level of aerobic intensity for experienced students. View high definition versions of these high quality videos on your computer, with full screen option. Stream the videos to your internet connected device. Learn 12 simple, highly effective Yoga poses that take only a few minutes each to practice. You can use these valuable moves individually at various times during your day to release tension and tightness, increase mobility, slow the aging process, keep energy flowing and keep your body balanced. Detailed verbal instructions are given for each posture in this audio. The entire sequence of 12 can also be practiced together for a complete practice. Stream the audio to your internet connected device. on Digital Audio - 62 min. By integrating qualities of attention, awareness, caring, and insite into all arenas of living, you reach the deeper core and more essential meaning of meditation. This narration of Ganga White's moving and inspirational teachings on meditation guide you on a journey to understand the nature of the mind, consciousness and spirituality. Anything in life can be part of the meditation process making the benefits of meditation accessible for everyone. Freedom and awakening are possible without dependence on regimented practices and beliefs making learning, growth, and wisdom available each moment of life. The nature of meditation is explored and revealed and several useful meditation techniques are given. Stream this audio content to your internet connected device. 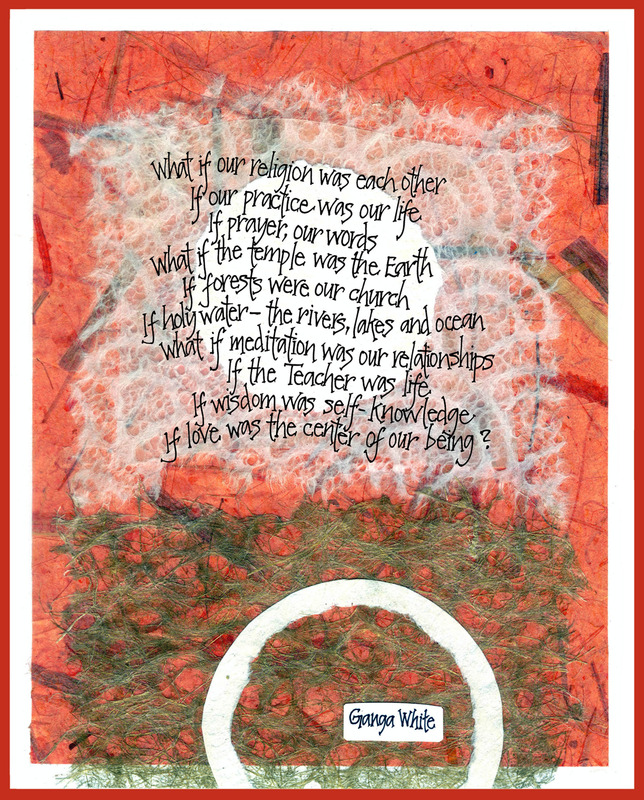 Original poem written by Ganga White. Glossy print sizes are 5x7 or 8x10. Also available in a matted print edition (framing size 8x10). Enjoy internationally adored chef Beatrix Rohlsen's superb cookbook featuring the renowned gourmet vegetarian cuisine served at our White Lotus Foundation Santa Barbara Retreat. The Art of Taste is Beatrix's collection of extraordinary soups, salads, main courses, breads and desserts. This beautiful book features easy to follow recipes that teach and inspire health and well being. The Art of Taste includes this world traveling artist's paintings and poetry as well as over 100 eclectic and exotic offerings. Foreword by Tracey Rich.